The matchmaker has met her match. . .
Flannery McNeill has sworn off men. . .at least the handsome, charming kind who are nothing but trouble. So when handsome and charming Jamie O’Connor shows up as an usher at her best friend’s wedding, Flannery tries her best to avoid him. But it seems like someone is conspiring to throw them together. Two someones, to be exact—Flannery’s grandfather and Jamie’s grandmother. Maureen O’Connor thinks Kirby McNeill’s granddaughter is perfect for her grandson and convinces Kirby to help make the two a couple. But soon the matchmakers find the tables turned when Flannery conspires with Jamie to play matchmaker, too. As the juniors scheme to bring the seniors together, a hilarious tumult of mayhem and misconceptions ensues. . .but will it end in romance? YAY! A book I got to read JUST for fun! That’s not to say I don’t like the other books I’ve been reading and reviewing, but this one was ONLY because I love Kaye and I love her books. I actually won this book in her blog drawing a few months ago – in fact, I won all three of the series, autographed, of course ;). I already had a copy of book 2 so it became a Christmas present and these found their way to my shelves. And this was on the top of my stack. So I read Turnabout’s Fair Play in just over a day. I love Flannery and Jamie! Plus I love seeing Caylor and Dylan and Zarah and Bobby from the first two books and seeing how their stories have played out. Now… I’m not a total geek. I don’t role play or paint ball or laser tag or any of that stuff. But I’m just geek enough to laugh hysterically when my sister asks her iPhone/Siri what the meaning of life is and Siri says “42”. So when the world of fan fiction and laser tag and the King Arthur fandom comes into play, I was highly amused. Much more so than most people probably would be. While it made me squeal a bit, it wasn’t quite so over the top that those who aren’t as geeky as I am would be totally off-put by it. So there’s Flannery and Jamie who are fighting their attraction for each other. Secrets which have to be dealt with, because without them the plot would be boring. Plus there’s Jamie’s grandmother, Cookie, and Flannery’s grandfather, Big Daddy, who have serious crushes on each other. The characters are wonderful. The writing is wonderful. The saddest part about the book is page 315. I’ve not read Kaye’s historicals [though I have book 1 in her Ransome series]. She’s working on a series set in the 1850s now [The Great Exhibition Series – set at Prince Albert’s Great Exhibition in 1851]. I find myself wishing she was writing another contemporary series because I know I love those – both The Matchmakers and Brides of Bonneterre. Will I read the others? Of course. Because I do love Kaye and I do enjoy historicals as well as contemporary books. 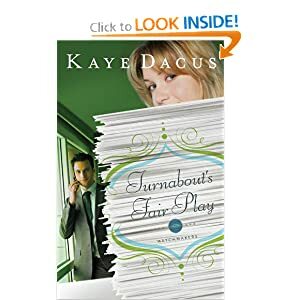 Kaye’s characters are loveably quirky, real, flawed, and wonderful. And for that I’ll follow her to any time period. Plus Kaye’s pretty cool too ;). Turnabout’s Fair Play is book 3 in the series. While someone who has read the first two will likely enjoy the 3rd more, they’re not strictly necessary to read first. The Hitchhiker’s Guides series. It always makes me laugh. Particularly if I can get the audio books to listen to while I’m working at the computer or going on a road trip.I also like The No. 1 Ladies’ Detective Agency series by Alexander McCall Smith (which are also lovely in audio book form).Of course, most of what I read these days are pictures books. My little peanut is currently obsessed with one of the picture books I had when I was little. I loved that book, and the binding is pretty much shot to heck, but the illustrations are delicious.